Peyton discovered cave tours last year when I took her on one in southern Minnesota. From that moment on, she has been begging to go on more cave tours. South Dakota has several guided tours available to the public at various caves. Since we were already exploring Wind Cave National Park I decided to take the kids on tour through Wind Cave. There are several tours available at Wind Cave National Park with various degrees of skill difficulties. Because Peyton is only 6 years old I decided to take us on the scenic cave tour. The scenic cave tour is the easiest of all the cave tours. It’s like a leisurely, guided walk through a cave that lasts a little over an hour. It sounded like a perfect tour for two children. Remember to bring a light jacket or sweatshirt. It’s roughly 53 degrees in the cave. To go on the tour you will need to stop in the visitors center and purchase tickets. I suggest getting there before noon. The website said they sell out most days and the only way to purchase tickets is in person. Once you purchase your tickets you are free to roam around the visitor centers, the park or even head into town for a while. You just have to be at the cave entrance when your tour starts. When it’s time to start the tour, a ranger will come over to the entrance and take everyone’s tickets. He or she will go over some basic safety rules and ask if anyone has a medical condition or is claustrophobic. If you have a medical condition, depending on what it is, you may not be able to go on the tour. There were over 300 steps on our tour. And if you are claustrophobic, the ranger will suggest you sit this one out. They do turn off the lights while you are in the cave and in some areas it’s a tight fit. So not a place someone who is claustrophobic would want to be. After you go over the safety rules, the ranger will start taking you down to the cave entrance in small groups. Once the whole group is in the holding area, the ranger will give you a little history of the cave and demonstrate just how fast the wind blows. Then it’s time to start the tour! Both kids loved the cave tour. There were three stops throughout the tour. 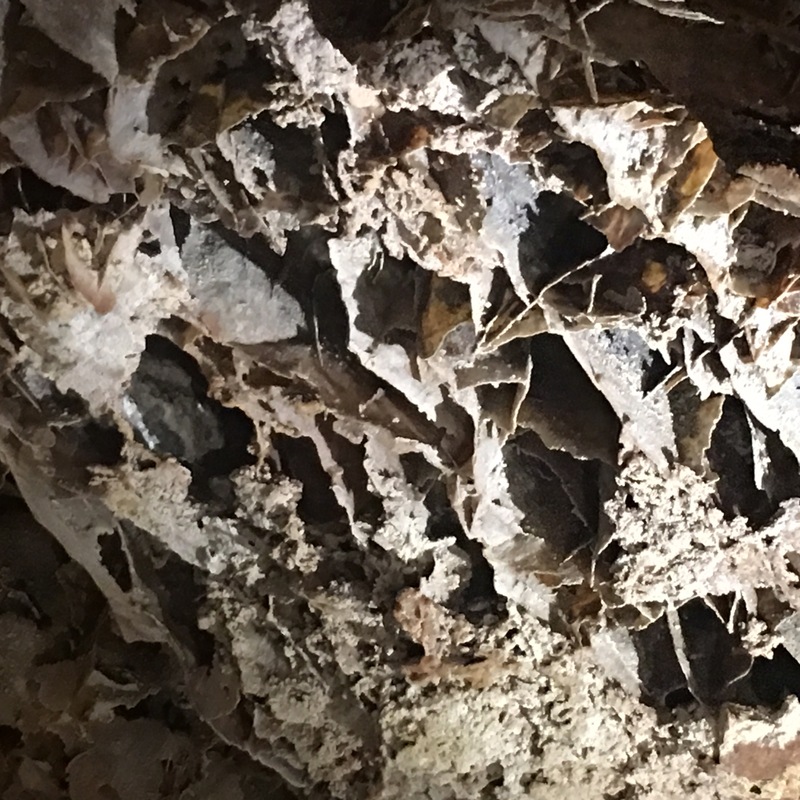 Some of the biggest highlights of the cave tour is the boxwork. Boxwork is made of thin blades of calcite that project from cave walls and ceilings, forming a honeycomb pattern. The fins intersect one another at various angles, forming “boxes” on all cave surfaces. 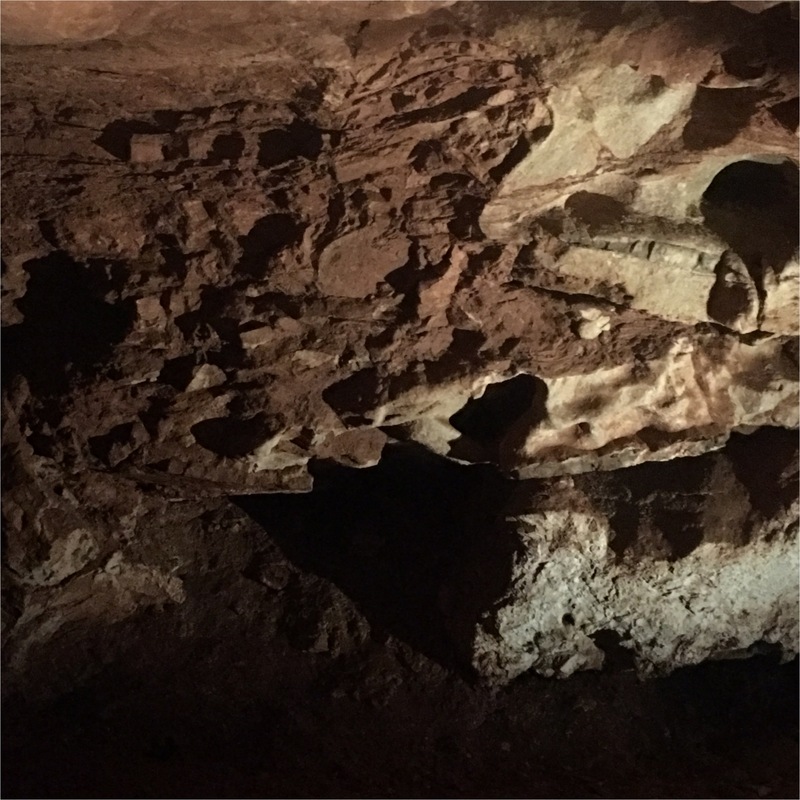 Boxwork is largely confined to dolomite layers in the middle and lower levels of Wind Cave. When we came to an area of the cave that had extensive boxwork the ranger let us stop. Everyone got a chance to get close and really look at how delicate and fragile the boxwork is. Another stop on the tour was to see the historical markers from the 1800s. Back when Wind Cave was being discovered, different explorers would write their names on the cave walls. This was partly to say and show that they were there and to mark what areas of the cave they had explored. 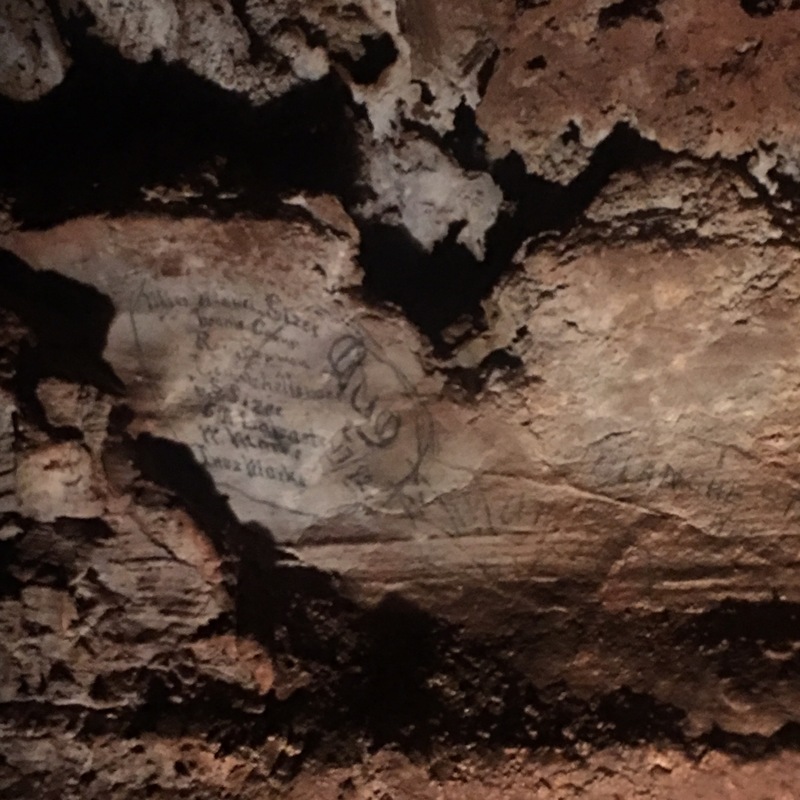 It was pretty neat to see handwritten names on the cave walls that were over a 100 years old. When it was time for the tour to end, the ranger took the kids through a tunnel to get to the doorway. The adult had to stay on the walkway and walk all the way around to the exit. It’s little touches like these that makes a trip memorable for children. Now both kids are obsessed with caves and are begging me to take them to Kentucky where they have some of the biggest caves with tours. I’m sure one day we’ll get there but until then there is plenty of caves to explore in the midwest.